Kenstar 17 L Grill Microwave Oven (KM20GWWN, White) is a low price unit with impressive features and high capacity. The highlights are 17 liters of capacity, 5 power levels and 3 years warranty on the magnetron. There is no doubt that Kenstar is very popular for many home and kitchen appliances. Kenstar KM20GWWN has 3 years of warranty on magnetron that provides you with complete peace of mind. It has a unique function that is called Sensi Grill. This Sensi Grill feature is very helpful to set an alarm cycle as a reminder to turn the food. So this is really a good option for those who want to prepare various types of Indian snacks that taste good. Further, Kenstar KM20GWWN comes with Combi Function 3 (M + G). So it combines three cooking modes such as microwave, convection and grill modes. Also, it has Auto Defrost feature for frozen hard foods that are thawed instantly. Another great feature is cooking-end signal that beeps when a cooking cycle ends just to notify yu the food is prepared and it can be served. 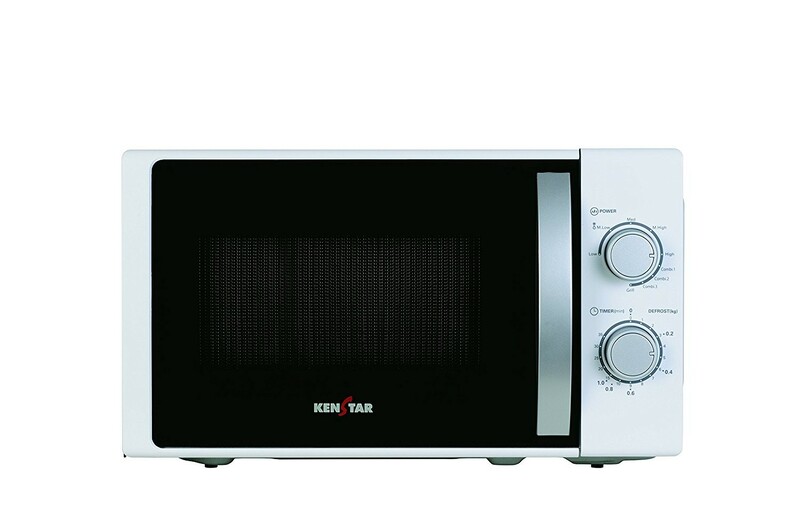 This Kenstar microwave oven has high gloss acrylic glass door and mechanical 2 knob control. It has 255-mm turntable diameter with a long cord and anti-bacterial coating. Other important features are express cooking, large grill stand, 17 liters capacity, one year warranty on product, 3 years warranty on magnetron, 1050 watts power, 220-240 operating voltage.